Deed Forms. Satisfaction Guaranteed. Protect Your Rights. A Deed is a legal, written document that officially and legally transfers one’s right to title in property to another person or entity. Deeds will generally contain information about property, the seller (who is called the Grantor), the buyer (also called the Grantee), as well as signatures of all the parties. Quitclaim Deeds - Which transfers property without a warranty. Warranty Deeds - Used to transfer a property interest with a warranty. Premier Deed Forms Combo Package Get 5 forms for just $39.95. Save 55%! Save money by getting all of our Deed forms together in one convenient packet. Holding a “deed” in your hands can represent a seminal moment in your life. You can imagine the first time you held the deed or title of your first home in your hands, or the first time you officially received title over the car you finally finished paying for. But there are a number of deeds that can affect us throughout our lives, and they don’t only show up in the big moments, but even in the not-so-big moments. That’s no reason, however, that you’ll want to pay any less attention to deed forms and understand what they’re all about. In this article, we’re going to take a closer look at four different types of deed forms to truly understand what they consist of. Once we define and explain each one, you should have a real grasp over what deed forms will be most relevant in your life - and which deed forms you’ll want to start using right away. 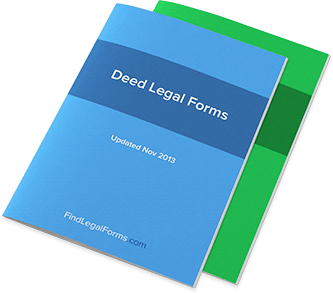 Without any further ado, let’s check out the various deed forms. Quitclaim Deeds: These can be referred to as the deeds with the “funny name,” but you’d be surprised just how common and necessary these deeds can be for conducting business. In short, quitclaim deeds are agreements put into writing that verify a transaction has taken place and the seller is giving up the deed and title to a specific thing, often a house or a car or other similarly-large item. Quitclaim deeds should be signed by both parties and will necessarily include other issues like what is being traded and when the trade has taken place. Contracts for Ddeeds: Also known as “land contracts” or “installment sale agreements,” contracts for deeds are essentially purchases of real estate in which the loan is not granted by a third party, but by the selling party. In other words, if you have a contract for deed, your “mortgage” is actually what you owe to the person who sold it to you, with the payments being defined in the contract for deed, or land contract. This can be a good way to keep banks out of the process if need be, but most people actually do not have the need to keep the banks out of the process. General Warranty Deeds: Quite simply, a general warranty deed is a document that says “I have the right to sell this item or piece of property, and the title necessary to do so.” For many people, making a purchase to someone and finding out that that someone doesn’t actually own what’s being sold can be a major disappointment, which is why general warranty deeds certainly have a role in keeping transactions honest, with the weight of the law behind them. Special Warranty Deeds: Much like general warranty deeds but carrying much less weight behind them, special warranty deeds typically are used by executors and trustees rather than in general transactions.